Generally, most hotels have been quite accommodating of my needs as a pumping mom. Although many properties provide in-room refrigerators as a matter of course, there are still many hotels where a unit must be requested. The best practice is to request the fridge at the time of booking and indicate in your reservation that it is a medical necessity. Upon check in, it is wise to confirm that the fridge has been delivered to the room (or will be shortly). 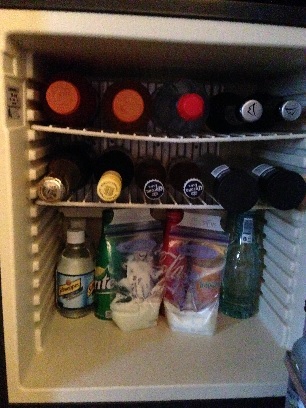 Using the minibar fridge to store milk in LA, May 2015. On occasion, I have had some pushback from front desk staff either wanting to charge me for the use of the fridge or being reluctant to find a unit. In these cases, I have been polite, but firm. I state that I need the fridge to store breast milk and thank them for accommodating me. If the person with whom I am speaking pushes back, I thank them for their assistance and, again, politely but firmly, ask to speak with the manager. It is also helpful, in the face of extreme difficulty, to look up and have ready to dial the corporate office customer service number. I have never had to resort to that measure, but know some moms who have. Some hotels provide fridges in the room in the form of the minibar. Before using the minibar to store your milk, you should check to be sure that the unit is on its coldest setting, as some units are not intended to be used for food storage. If the minibar fridge does not feel cold or you do not have a way to be sure that it is truly keeping its contents cold, call the front desk and request a standalone unit. Some minibars use pressure sensors to automatically record and charge for items being removed. These units tend not to be suitable for storing milk and a back up fridge should be requested. In one instance, I was not able to use the fridge in my room and the hotel did not have additional units. Instead, the hotel stored my milk in the main kitchen’s walk-in cooler. They actually sent someone from room service up to collect the bags and kept them in a sealed plastic box. Upon request, hotels will also, generally, freeze milk for you. Again, it is best to ask ahead and remain polite, but firm.